After the financial collapse, banks began to ditch their vaults. Once seen as a value-added service for customers, with cash tight banks were in cost-cutting mode and safekeeping goods was viewed as an unnecessary luxury. That gave Seamus Fahy the idea for his business. The Limerick native had just started a diamond-selling firm in 2009 and was looking for a place to store his valuable stock. Told again and again by the major banks that they were not providing vaults any more, he decided to offer it himself. Merrion Vaults functions as it sounds: the business offers vaults where customers can store their valuables. “For years I had a box in London but when I came back here I could not get a safe deposit box,” he tells Fora. He then set up a holding website, Safedepositboxes.ie, to gauge the level of demand for the business. After getting a slew of messages asking when the business was opening, Fahy decided there was a market. “Then it was just a matter of finding the right location and finding the investors,” he says. Three years and a €1 million investment later, Merrion Vaults was up and running in Dublin with a vault of about 2,500 storage boxes. It has since opened a similarly sized facility in Glasgow. 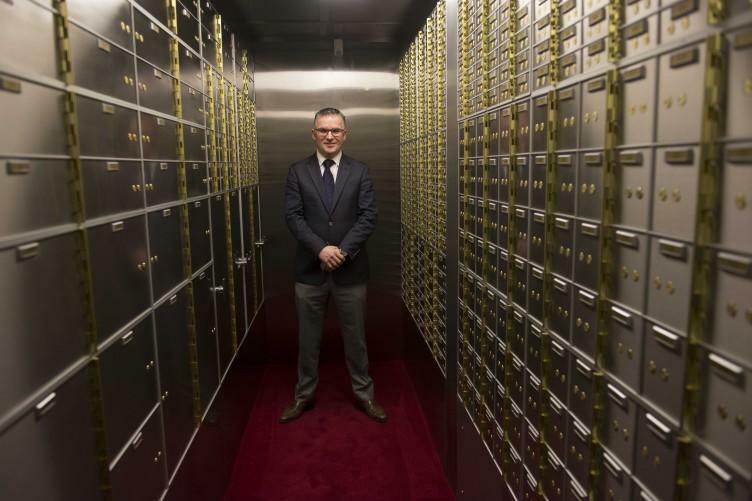 If you have have a particularly large or bulky valuable, or if you are feeling particularly paranoid, the vault also has a strongroom that can be rented out for €12,000 a year. Customers pay a €100 deposit up front which they get back at the end of their contract. The company’s costs are largely fixed with the investment stage requiring the largest chunk of cash. Fahy says that the Dublin and Glasgow vaults required an investment of about €1 million each to get off the ground. “That includes all the tech you need for the vault like CCTV, fire safety, motion sensors, everything,” he says. “The vault has to be built to certain specifications so that our insurers are happy”. About half a dozen staff manned the company’s Dublin vault once it was up and running, although Fahy says there are plans to increase this slightly. Fahy says his prices are affordable for the vast majority of people and claims that most of his customers are regular workers. “I’d say 65-70% of people would be normal Joe Soaps,” he says. “They might have their mortgage paid off and want (to store) a title deed to their house, they might have family heirlooms, things like that. The company is also eyeing up a move into continental Europe after opening in Glasgow earlier this year. There aren’t many other players in the Irish market when it comes to heavy-duty vaults; most of the banks stopped offering them as a service after the recession. Here, Fahy’s says his main competition is more likely to stem from your local DIY shop. “We would mostly be competing against home sales stores and just people who think that their valuables are safe under their mattress,” he says. A decent-sized personal safe can range from a few hundred to a few thousand euros. However Fahy argues that even with a personal safe someone’s belongings are not secure in their homes. If Merrion Vaults does decide to enter the continent, there will be larger banks still offering vault services to compete with – unlike in Ireland. Fahy says the firm will target areas affected by the closure of traditional bank branches adding that the company’s independence could be its advantage. “A lot of people don’t trust banks and would prefer to go to an independent company not linked to a financial institution. Also in a lot of banks if you want a vault you need a bank account and a minimum amount in it; there’s none of that hassle with us,” he says. As well as offering deposit boxes the company has started offering customers the ability to buy gold coins or bars, which Fahy says is gaining traction due to people being worried about international factors such as “political instability or the euro weakening”. He claims the firm has had several hundred orders for this service since it was launched several months ago. Fahy says plans are well advanced for a third vault with London the most likely location. This is the first in our weekly series examining the nuts and bolts of businesses. If you would like to see your business featured please email news@fora.ie.